These days, there are hundreds of apps and sites designed to entertain the kids. Today we look at a relatively new streaming service designed for children. It’s called Kidoodle.TV. With an iPad and iPhone app, and an app for Android phones and tablets, Kidoodle.TV is designed for on the go TV streaming with kids in mind. The apps and the easy to navigate Kidoodle.TV website have controls that are both fun and simple to operate. Kidoodle.TV has an ever growing variety of cartoons, kid sitcoms and even nature and wildlife shows in a safe, ad and commercial free package. What differentiates Kidoodle.TV from a lot of the competition is that they know that all too often kids can spend too many hours in front of the TV or online. As parents we do our best to set guidelines, but all too often half an hour can easily stretch to two hours or more when we find ourselves enjoying the freedom it gives us. Kidoodle.TV has easy parental controls built right into the app and their website that allows parents to set password protected viewing time limits every time they begin a new session. You can quickly choose from 15 minutes to 3 hours in 15 minute increments. For your older children (or those of you that are young at heart), you can also set the time to unlimited. Not only that, they also allow you to set up profiles for every child that can be customized with their interests in mind. We have a five year old who loves Yo Gaba Gaba, but we really don’t want her watching the superhero shoes our eight year old loves, and there’s a setting for that. Want to personalize your little one’s profile with their favorite color or favorite character? There’s a setting for that as well. We tried Kidoodle.TV on both our laptop and the iPhone app and it streamed well on both with good quality. We got so carried away watching one of the cartoons we even forgot about this review. One of the nicest features is that when you run the app on the phone or tablet, you can quickly lock the screen so that any accidental taps don’t stop the video that’s playing. It’s easy enough for a parent to unlock, but it will prevent your three year old from constantly fast forwarding or selecting another show by mistake. We also like that the website interface tracks what episode you’ve already watched and you can quickly continue the next episode without wasting time having to figure what they already watched. We loved everything there was about Kidoodle.TV. The only negatives we had were what we found missing. Kidoodle.TV is a new service, with shows added all the time. For now, their show selection is catching up to what’s offered on Netflix or Amazon Prime. For parents with young kids, Kidoodle.TV is a much more child-friendly option. What Kidoodle.TV does give you over both Netflix and Amazon Prime is better viewing control. 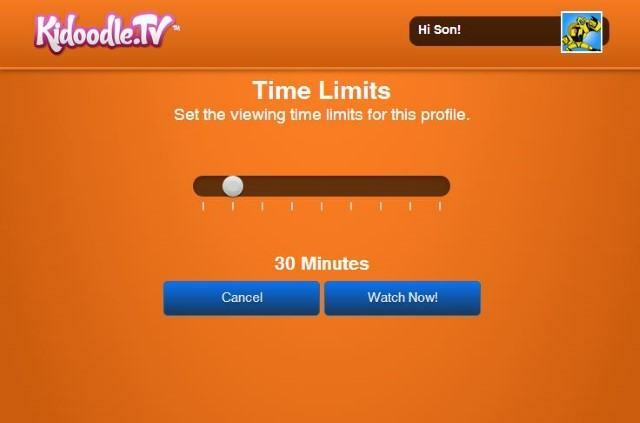 Kidoodle.TV not only allows you to limit what your kids watch but also for how long in one stretch. Netflix does offer child profiles, but they can be switched over to adult settings with a few simple button presses. Given that almost every three year old can seamlessly navigate an iPhone, a few simple clicks doesn’t seem like much of a security feature. On Netflix, there is no lock option for the really young viewers. If you’re looking for something on the go that will easily let you load up a show on a mobile device, Kidoodle.TV’s quick and easy controls are hard to beat for young kids. 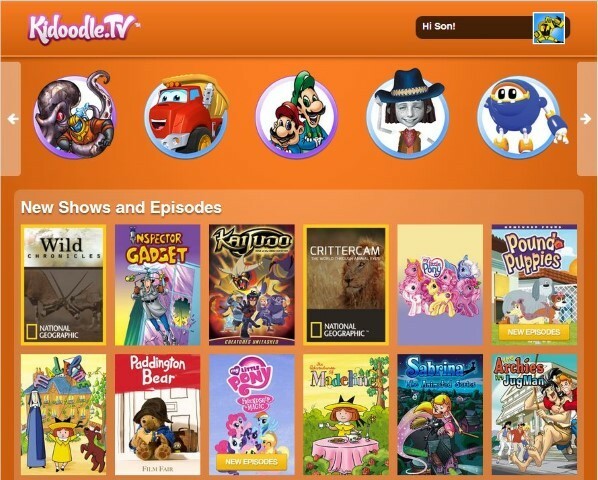 How does Kidoodle.TV stream to your TV? We manage to stream the app from our iPhone to our Apple TV with ease and people have been successful pairing the Kidoddle.TV app with Google’s new Chromecast so there are ways to watch it on the big screen easily enough. 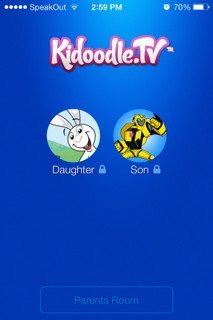 Another problem with Kidoodle.TV is that they don’t have the same brand recognition. Both Netflix and Amazon Prime can be loaded on everything from game systems to smart TVs so parents hoping for a simple big screen solution from Kidoodle.TV would need to look into additional purchases. That being said, we’ve learnt they’re currently in the process of fixing both of these shortcomings with more shows being continually added and greater support on standalone big screen TV products in the future. Where to get it? And a 25% off discount code for Kidoodle.TV! Kidoodle.TV costs $4.99 a month however they offer a 14 day free trial (no credit card required) so you can test it out for yourself. There’s also an ongoing deal where they give you an extra free month for every 4 people you refer. If you’re interested in checking it out, grab Kidoodle.TV from the App Store or the Google Play Store for the free player and start your free trial today. Kidoodle.TV is offering our readers a 25% off code for a year subscription to Kidoodle.TV. This coupon expires June 30, 2014. The discount code is MCC25. Don’t forget to enter to win one of 3 iPad Minis being given away in March and April by through the Kidoodle.TV Facebook Page. By inviting friends, you can earn four weeks free. Tip: You can find your Personal Invite Link found in the Parents Room through the Earn Free Months tab. Each time four of your friends accept the invitation as a new subscriber to Kidoodle.TV, you will earn one month of free Kidoodle.TV, which is automatically applied to your account! I’m sure my 4 year old would like this. We try to limit TV though. This is great for people that limit their children’s watching time. They have great shows but you still can make for sure they do other things. I should look into this for my 3 year old nephew. He asks to watch TV here sometimes if its rainy or he doesn’t feel very good but we don’t have cable so there aren’t usually any children’s shows on. LOVE the time limit feature! I love that this is on Android tablets, my kids have Kindles. I bet they would love this, especially the youngest. What A Great Site For The Kids Lots Of Great Movies & Thank You For The Great Giveaway!! I really like this!! I have a 3 and 6 year old!! I especially love the time limit as most of the time I don’t keep track but would really like them to watch only a limited amount of time!! this is great to monitor children’s movie/tv time, i need this. My daughter loves kidoodle! I love that we could set a timer.